Cheltenham-based artist Emma Howell will showcase her work at her very first solo exhibition this month. The exhibition, called ‘Homegrown’, opens on Friday 3rd August at the Aroundabout Sound music shop on the lower high street, a premises Emma’s father owned before his untimely death two years ago. After a tough couple of years, in which Emma temporarily walked away from painting altogether, she’s now looking forward to putting her finest work on show. She said: “There’s 30 paintings in the exhibition altogether, it’s my very first opportunity to show my work off to the public and I’m really excited. “It’s been a really horrible couple of years since dad passed, but I’m now re-focused on my art, it’s what I love doing. All my pieces at the exhibition will be for sale. I’ve been very fortunate to sell a few of my most recent works to collectors in America which is very exciting. I run my own online shop, I’ve sold paintings all over the world which I’m very proud of. 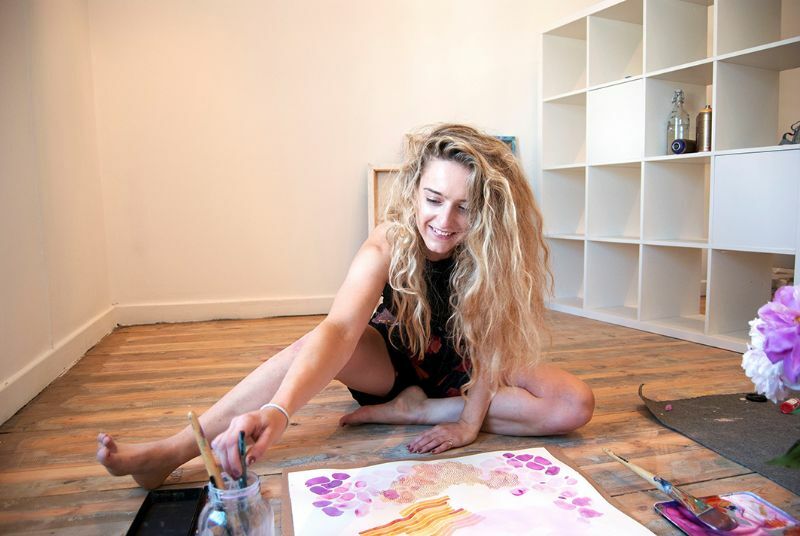 Emma graduated with a first-class degree in fine art in 2015 from the University of Gloucestershire but lost the appetite to carry on painting after her studies finished. She continued: “I found the initial few months after leaving university quite tough, I had lots of doubts whether this was the career I wanted and whether I could make a success out of it. I actually gave up painting for a short while, things were that bad. Then my father passed away. Dad always said I should work for myself, it’s been a long journey but I’m where I want to be now. “My exhibition represents the 18 months or so since dad died and all the emotions I’ve been through. I suffered a lot, my health wasn’t good, I lacked motivation and became very detached from the outside world. “Organising this exhibition has been very stressful and hectic with a lot of physical work involved. It’s so expensive to exhibit your work at a professional gallery so that’s why I decided to put on my own exhibition. “My paintings are very abstract, I take inspiration from looking at the world differently. Living in Cheltenham is great for an artist, there’s such amazing countryside on the doorstep which provides me with a lot of inspiration for my artwork. ‘Homegrown’ runs from 3rd -17th August.